Manectite (Attached to Augustus) - This item allows Manectric to Mega Evolve into Mega Manectric when held during battle. Sculptor's Token (Attached to Wiglaf) - The Sculptor's Token symbolises one's skill in navigating and manipulating the beautiful surroundings of a winter wonderland. It can be attached to Ice type pokémon only and greatly enhances their species characteristics. The wearer becomes very sure footed and will maintain full mobility and stability regardless of the condition of the arena floor. Ice type moves which have a secondary effect such as freezing or stat drops are twice as likely to have the effect triggered when used by the wearer, these effects also being slightly more potent. The token also provides fortitude and good cheer, rendering its wearer more resistant to moves which negatively affect its mental state such as Supersonic and Swagger. This token may be purchased during the Christmas 2013 event and may be purchased up to one time per trainer. Nightstalker's Token (Attached to Vito) - The Nightstalker’s Token can be attached to Dark-type Pokémon only and greatly enhances their natural abilities. The wearer’s ability to trick the opponent is greatly increased, as is their ability to scare opposing Pokémon, regardless of intelligence or stature. In addition, the wearer’s curses are more difficult to remove and have more potent effects than they would usually. The wearer can use attacks like Sucker Punch up to twice on the same target, instead of the usual one use limit. This item causes the move Fling to deal Dark type damage if it is thrown. This token may be purchased during the week long Halloween 2014 event and may be purchased up to one time per trainer. RotM Free Mega Stone (Audinite) - This item allows Audino to Mega Evolve into Mega Audino when held during battle. This may be claimed in the trainer and service points thread and exchanged/switched at any time (like you can with regular mega stones on special events). Wishing upon the power of his allies, Vito unleashes a large amount of Dark type energy onto the surrounding, causing the opponent to flinch and possibly interrupting their attack. The energy will also reinvigorate Vito akin to Wish. This may only be used twice per battle and uses a significant amount of Dark energy. Dreiberg managed to learn how to use Barrier and Light Screen. Furthermore, he is able to use Barrier, Reflect, and Light Screen using Normal energy but for an extra minor amount of energy per use. Upon focusing on defensive tactics, Dreiberg has completely forgotten how to use Steel Wing and Psychic. Using a significant amount of Fighting energy, Barbara creates an energy construct the size of her body and shaped like a balled-up human fist. She then sends the construct flying toward the opponent for a significant amount of Fighting type damage. Barbara can use this move twice per battle. The attack is considered as an energy-based attack. Using a considerable amount of Ground energy, Lobo spews forth a stream of mud that deals a light amount of Ground type damage. The mud then hardens around the opponent’s feet and sticks them on the floor. 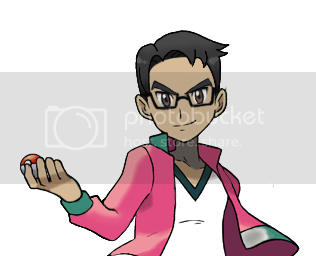 This prevents the opponent from being returned to their Pokeball, and will momentarily slow movement. The mud usually lasts a turn after its use, in which it then cracks and disappears. Lobo can use this move twice per battle and only once per opponent. Using considerable Flying energy, Tayuya releases a concentrated blast of energy through her ears. The blast travels as fast as sound and knocks back the opponent a considerable distance regardless of their weight. The blast’s low-frequency property causes discomfort for the opposing Pokemon, thus lowering their Special Defense by 10% immediately after (standard boost stipulations apply). The blast can only strike one Pokemon at a time, and does not deal damage aside from possible collision or fall damage. Moctezuma jumps high in the air and glides toward the opponent. He then spins in the air before delivering a strong spin hook kick to the face or wherever applicable. The kick deals solid Ground damage and is considered similar to moves like Fly or Bounce. The attack has a 20% chance of inducing confusion due to the sheer strength of the kick. Moctezuma may only use this move twice per battle. Hester is now familiar with the Ground type. She also learned how to use Drill Run and Mud Bomb, but has forgotten how to use Pluck and Mirror Move. Also, because of her time spent with tough Desert Pokemon, she refuses to use Fake Tears, preferring to fight without making herself seem weak. Using high Flying energy, Raptor flaps his wings, sending sharp razor winds that swirl around the opponent. The winds would buffet the opponent greatly, leaving small wounds that become exploitable like Crush Claw spots in slapsticks. The move deals heavy Flying type damage. Raptor also has the ability to add small rock fragments in the attack, making the move deal heavy Rock type damage for high Rock type energy instead. To signal whether the move is Flying or Rock, the move would be ordered as either 'Primordial Storm - Rock' or 'Primordial Storm - Flying'. Raptor loses access to Stone Edge and Tailwind for his training with the technique made him forget how to use these moves. Using significant typeless energy, King Bradley darts toward his opponent with great speed and tenacity, expanding the length of his sharp beak right before he strikes. The sudden expansion is enough to knock back the opponent, with the amount of knockback dependent on the foe’s weight. Opponents heavier than King Bradley receive the most knockback distance, being flung a good distance irrespective of their weight, while those lighter than him receive little to no knockback. The move deals significant typeless energy. Using heavy energy, Grayson forms an orb made of Ground or Flying energy through his tail, claws, or mouth, and flings it at the opponent with great force. While traveling toward the opponent, the orb quickly expands into a full-scale violent twister that deals heavy Ground or Flying damage, depending on what Grayson has chosen to use. The twister is only able to pick up and throw around Pokemon that are lighter than him. Miikhael is now Electric/Flying, with the same weaknesses that come with the type change. He now knows how to use Discharge, Spark, and Parabolic Charge. He is now only familiar with the Psychic type, and thus cannot use the following Psychic moves: Cosmic power, Synchronoise, Skill Swap, Future Sight, Magic Room, Trick Room, Psybeam, and Psywave. Also, due to his time in the sandy desert, he has forgotten how to use Ice and Rock type moves, therefore not being able to use Icy Wind, Ice Beam, Ancient Power, and Smack Down. Mikhael retains his Species Characteristic description, and can see in the dark. Yellowbeak now only takes 2x damage against the Electric type. However, he is now only neutral to the Water type and the Steel type. Pacman is now only Flying type, though he retains familiarity with the Bug type. He no longer benefits from the Bug type’s Species Characteristics. Furthermore, he chose to forget certain Bug moves that no longer benefit his quest for greatness. This includes U-Turn, String Shot, and Infestation. He believes that such moves are only used by Bug types who cannot fight back. Battling alongside Bug-typed Pokemon no longer gives him a boost in attack. Using significant energy, Peanut materializes a glowing white bone within his jaw. He then runs to the enemy at high speeds, tackling them for decent Normal damage. As soon as he tackles the opponent, the bone flies back to Extroph, and Peanut runs back to his Pokeball. This attack is basically a Normal-typed U-Turn. Keena coughs up a pink and fluffy furball using considerable Fairy energy and spews it forward. The Fairy Furball explodes into dust upon contact, dealing good Fairy damage. The dust it expels has a significant chance of confusing the foe, just as much as Discharge has to paralyze. Keena is able to use this move twice per battle. Last edited by Extroph; 09-20-2016 at 05:02 PM.